Truth is a gift. When it is offered to us from another we ought truly appreciate it’s value. Truth is a treasure unlike any other and can lead us towards enlightenment and love or be cast aside as we choose the path of darkness and distraction. Yes, truth often can illuminate things and is the catalyst for positive changes! The fear of change can block us from pursuing our soul’s true desires. This fear can cause us to miss out on opportunities of goodness and growth. This can be a huge problem as God speaks to us in truth and in love! Truth can indeed be a very scary thing! It can frighten us and our own sense of security and peace. Truth forces us to let go of the lies that often enslave us. We feel safe locked away in our dungeons of deceptions… locked away from others, away from the risk of getting hurt. There are indeed many times when we don’t want to hear or know the truth. Feeling safe in our self-deceptions we settle for mere existence by avoiding truth. We do this because facing truth often forces us to challenge our static views and it feels too risky. We feel too vulnerable! Too afraid! Yet truth is worth the risk! Truth is what will unlock the prison door of our hearts and free us into the light: to live and love as God Himself intended! Truth will set us free and help us become who we are meant to be! Is that how blondes spell “Pacified”? With an “s”? I understand “truth” written with a small “t”, but never with a capital “T”. My experience is the capitalizers are either German (they capitalize all nouns 😉 ), or people with an agenda to create their favorite abstractions. So, I never view “truth” as a gift — but as something fought for or happened upon. There are tons of “truths” (small “t”). But I have no idea about the capital fellah — well except that everybody wants to tell it it comes from their god and nobody else’s — like I said, “agendas”. I’m not sure what agenda I have by using a capital T… yet, I will consider your words. I write from the heart and will sometimes capitalize to emphasize things… artists discretion, ya know? Unlike spelling errors which are just a bit embarrassing but remind me and everyone else I am far from perfect and sometimes need a little help myself. Your comment provided just that! 😊Thanks again! I have readers that are kind enough to send me corrects (“truths” with a small “t” — I am ambitious for nothing more) all the time. It is like walking around all day with your fly up or food on your face — it is nice when someone is brave enough to tell you. Truth about ourselves can be painful and if not given in the right way, at the right time, can me more damaging then helpful. Tough stuff. I certain don’t belief of TRUTH floating out their in Plato’s heaven, or is New Age ether or in the matrix of reality. I don’t use the word that way. Nor do I tend to make blanket statements about any given truth. So, as for agenda, that is what I am referring to. I’m not hung up on the word agenda, but I hope that gives you a peek of how I use language and feel and be in my world. I’m not fond of abstractions, and abstract platitudes. I use to, but then I started feeling way more comfortable with the complexities here on this dirt ball. I changed the image literally right after you pointed it out! 🙂 Ha! Yes, truth can be damaging if we are not emotionally ready or strong enough to hear it, or are vulnerable in some way. Yet, I think many of us find comfort living in lies and hiding ourselves from the truth. I believe our lies are often more painful and damaging in the end. It isn’t truth but our own fears and pain that hurt us most. Sorry, I am getting lost in the hierarchies — I ate hierarchy comment (see here). There is meaning in everything — just no need to look for ONE meaning. Such an effort is horrible distorting. See my “Homogenizing” diagram here. People homogenize with God, The One, Buddha, Love, Peace, Family — ah, so much more. So desperate. But at different stages, I guess we need different things. 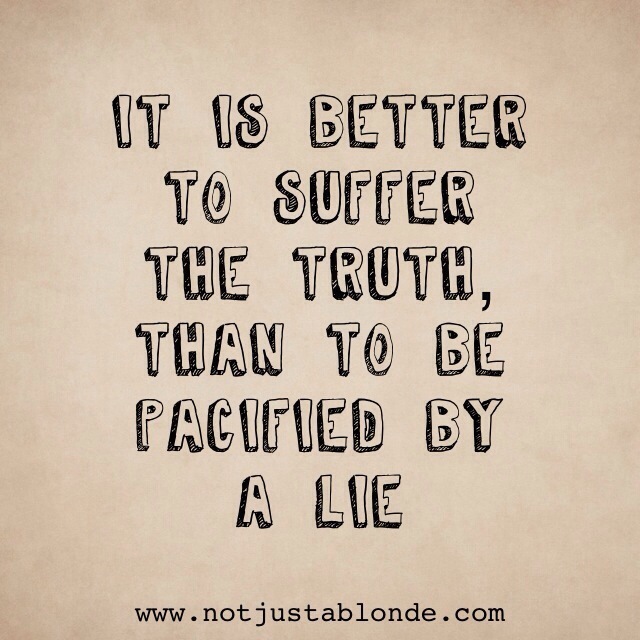 I agree, many find comfort in living in lies or self-deception or false abstractions. I agree. I have no faith that “in the end” we suffer more or less with lies. Just like it is not true that being honest, being kind and all that “in the end” works out better. I have no evidence of that. I may try to live like that, but I don’t think it is true. That is not WHY I try to live like that. A comment so far out in left field I think it’s gone beyond the stadium boundaries. Am very much in agreement with your comments on the value of truth. Truth heals, because it can cause people to confront things from which they have backed off, being unwilling to face them. In certain situations, it would be difficult to discern what is the most loving thing to do; however, God always knows this, and is willing to guide us, if we are willing to trust Him. If we are, we must expect surprises, because it can sometimes be seen from hindsight that our response has been the most loving thing to do, although we would never have been able to recognize this without just trusting God and doing it.